The terrorists to be set free murdered Jews young and old, including an elderly Holocaust survivor, with guns, knives, axes, and ropes. Kassem Hazem Shabir murdered Holocaust survivor Yitzhak Rotenberg Hy”d. Rotenberg, a Polish Jew, was sent to the Sobibor concentration camp with his family when he was a teenager but managed to escape from the camp and to fight in the ranks of the Partisan underground. He was also interred by the British in Cyprus before reaching Palestine. He joined the IDF and took part in the War of independence. He worked in construction. Alabed Hilmi Amawi murdered Yigal Vaknin Hy”d, 22, in 1993, just before the Yom Kippur fast. Vaknin's body was found in an orchard near Moshav Basra, where he lived and worked. He was survived by his parents and eight brothers and sisters. Awad Masalkha took part in the murder of Yigal Vaknin Hy”d and also murdered another Jew, David Reuven Hy”d, an Iraqi-born father of three who ran a mini-market in Petach Tikva. In 1991, Awad and other terrorists entered the mini-market, attacked Reuven, tied him up and beat him to death. He was 59. Ahmed Damuni murdered reservist soldier Amnon Pomerantz Hy”d in 1970. Pomerantz was on his way to reserve service in Gaza when he entered the Al Burej neighborhood by mistake. He was pummeled with rocks, murdered, and his body was burned inside his car. He was 46. He was survived by his wife and three children. Sharif Abu-Dahila murdered his employer of 15 years, Avi Osher Hy”d, in 1991. Osher, who was 40, managed the date grove at Moshav Masua. Sharif stabbed Osher to death and hid his body in a vineyard. Osher was survived by his wife and two children. Mustafa Ganimat and Ziyad Ganimat gunned down Meir Ben Yair, 33, and Michal Cohen, 32, Hy”d, at the Masu'a Forest, in 1985. Ben Yair was survived a wife and two children. Cohen was survived by a husband, two children, parents, a brother and a sister. Al-Afu Shakir murdered IDF soldier Akiva Shaltiel Hy”d, 21, in April of 1985. Shakir and other terrorists abducted Shaltiel as he was making his way from his base in Samaria to Rosh Haayin. His body was discovered near Beit Aryeh. He was survived by his parents and five brothers and sisters. Mahmoud Haga murdered Yosef Shirazi Hy”d. Haga and another terrorist managed to swim from Aqaba, Jordan, to Eilat, in May, 1992. Shirazi, who was employed as a security guard for the Hebrew Unversity’s marine biology research center, received word of suspicious movements outisde the research center and went out to check the premises. The terrorists gunned him down at short range. Muhammad Mukabal murdered Yaakov Shalom Hy”d, 40, in 1990. Mukabal and his accomplice in the stabbing murder were both employed by Shalom at the kitchen of the Ein Kerem Inn, which Shalom owned. He was survived by his mother, two daughters, and three siblings. Haza Yusef and Abdullah Bani-Hassan murdered Yosef Eliyahu and Leah Elmakayes Hy”d, two teachers, in 1985. The teachers were preparing a field trip for their pupils in the Gilboa area, when they were accosted by the terrorists. Eliyahu, 35, married and a father of five, was shot at close range, and Elmakayis, 19, was strangled to death. She had been a National Service volunteer. She left behind her parents and three siblings. Yousef Abdel Hajj murdered Genia Friedman Hy”d, 41 years old when, in 1992. He stabbed her to death as she walked down a main street in Kfar Saba. Abdel Hajj also stabbed and injured her father and two other people. Ahmed Abdel Aziz, Usama Abu Hanana and Muhammad Turkeman murdered Motti Bitton Hy”d, 32, in 1992. Biton, who lived in Ganim, was buying items in an Arab-owned store in northern Samaria when the terrorists came in, shot him and blew up an explosive charge. His wife, Molly, fired at the terrorists and they escaped. Issa Abed Rabbo murdered Ron Levy, 23, and his girlfriend Revital Seri, 22, who were hiking in northern Mount Hevron in 1984, near the Cremisan monastery. Issa tied them with ropes, put sacks on their heads and shot them. Massoud Amar murdered Ian Feinberg Hy”d, 30, a lawyer involved with economic development in Gaza. In 1993, he was conducting a business meeting in Gaza when terrorists burst into the room and told the other Arabs there to leave. They murdered Feinberg with axe blows and gunshots. He was survived by his wife and three children. 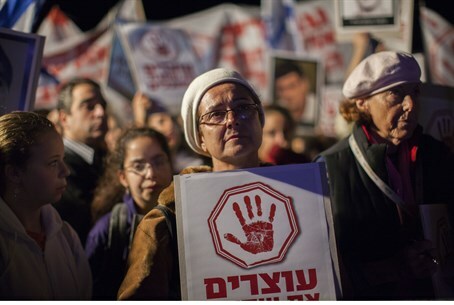 At last night's demonstration protesting the prisoner release, Feinberg's sister gave an emotional address to the crowd, in which she decried the "sale" of Israeli and Jewish blood "as a gesture.”. Asrar Samarian and Musa Kara’an Musa murdered Tzvi Klein, 44, a mathematician and educator, who lived in Ofra. In 1991, they fired on his vehicle when he was travelling from Jerusalem to Ofra, fatally injuring him. He was survived by his wife and three children. Ali Hader Razak killed IDF soldier Guy Friedman Hy”d in Bethlehem in 1990, in a terror attack that involved explosive charges planted at the entrance to the military governor's building. Guy was 19. He was survived by his parents and two brothers. Ibrahim Muhammad Nasser and Muhammad Rafaa Karaja murdered reservist soldier Aharon Avidar Hy”d in 1985, as he guarded the customs building in Ramallah. Avidar was 29, married, with one daughter.